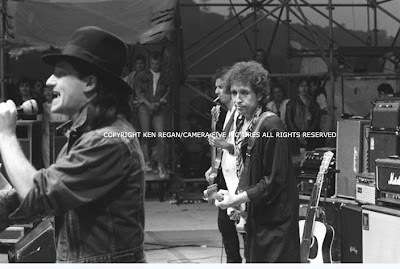 On July 8th, 1984, Bob Dylan played a concert at Slane Castle in Dublin that was flimed for broadcast on MTV. His band that night, and his touring band for the entire '84 summer tour, included Mick Taylor formerly of the Rolling Stones on guitar and Ian MacLagan formerly of The Faces on keyboards. Sitting in on the final seven songs that night was Carlos Santana. During Santana's extended sit in, Bono traded lyrics with Dylan during "Leopard-Skin Pillbox Hat" and a set closing "Blowin' In The Wind" and Van Morrison appeared on "It's All Over Now Baby Blue" and his own "Tupelo Honey". On the day of the concert, the publication Hot Press arranged for the young 24-year old Bono to interview Dylan backstage. When Bono arrived, he found Dylan in the company of Van Morrison. Read the fascinating full transcript of the interview/conversation between Bono, Bob Dylan, and Van Morrison. "It seemed Dylan had asked Bono if he would like to join him for an encore. Naturally, Bono said it would be an honor, the problem was that Bono didn't have the faintest idea what the lyrics to 'Blowin' in the Wind' were, and for that matter, had only the vaguest notion of the melody. A roar went up as Bono took the stage with Dylan, grabbed a microphone and began to sing......the first things to enter his head. Dylan looked rather startled as Bono improvised lines about the northern Irish conflict....clearly Bono wasn't going to let a little thing like not knowing the words stop him from performing the song. It was all going so well, and then the band launched as one unit into the famous chorus, while Bono, oblivious to the chord change, continued making up lyrics to the verse....Dylan's head swivelled as he turned to look at his guest with an expression of complete eye-popping, jaw-dropping disbelief. I watched transfixed as Bono hovered, on the verge of a spectacular crash, when, realizing his mistake, he started howling 'How many times? How many times?' like a blues mantra while the band brought the chorus home. Wisely, Bono let Dylan sing the final verse." Listen to the 'Blowin In The Wind encore, where Bono ad-libs a verse of a song he clearly doesn't know the words to. It's nearly a train wreck. Great post. The interview transcript is awesome. Van's version of It's all over now baby blue is outstanding. Also look for van doing just like a woman. So great. I think this interview was around the same time as that weird Dylan Morrison acoustic set from Greece covered by the weight a few months back. Given our posting frequency, in 'Weight' years 2007 was a few months ago! i bet that clip of bono butchering blowing in the wind haunts him at night, its abysmal, and could have been career ending. to me, this is a bigger travesty than sinead tearing up a picture of the pope on snl. although, after reading about what roger waters had to say about her at the wall show in berlin in '90, it seems she had it coming to her. was it really 2007? felt like a few months back. geeze. what am i doing with my life. speaking of great collaborations...ive done some reading about mythological meetings between dylan and G.Harrison around '67 through '70, in the city and up in woodstock. george was disillusioned with beatlemania and eastern philosophy, and was looking and thinking about quiting the beatles. He totally dug what dylan and the band were doing. there's a bootleg of dylan and harrison performing what sounds like a living room jam on "yesterday" then "if not for you" was borrowed by george harrison, which rounded out dylan's clear influence and virtual presence on all things must past. ballad of frankie crisp especially. followed of course by concert for bangladesh performances...man someone should make a movie about that friendship/collaboration. there's even a rumer that George brought some BIg Pink Band tunes back to Abbey Road studio sessions and there are studio jams of paul singing lead on the Band's "king harvest" with the rest of the beatles following along. my facts might be jumbled, my dates incorrect, but its worth looking into. My friend, whoever you are, if there is a clip of Paul and George jamming on "King Harvest," I will make it my life's mission to find that clip and post it on this very site. On a related note, I used to have that version of "Yesterday" on my old iPod. It was hard to gauge whether or not they were mocking the song (and Paul), but George had some sweet riffs and it's a pretty sick version of the tune. I imagine this was the rendition Paul wished he had recorded. Shouldn't it be "When Bono met Dylan"? Simon & ...Oak Ridge Boys?